Brand new Race-Driven rear brake rotors Race-Driven Severe Duty brake pads. Fits the following models: You will receive 2 brake rotors 2 Sets of Severe Duty brake pads. to replace both sides of the rear on the following models. 2010 2011 2012 2013. YAMAHA YXR700 RHINO FI 4X4 AUTO SPORT EDITION Race-Driven Stainless Steel rotors for you.r Yamaha Rhino matched up with Race-Driven Severe Duty brake pads for the longest life out there. Don't be fooled by others selling cheap organic, semi metallic or Kevlar brake pads they will not last 1/4 the thime of Race-Driven Severe Duty brake pads. 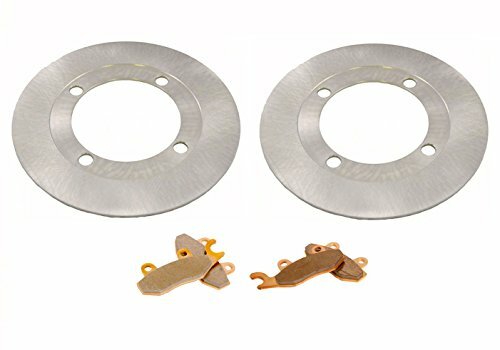 Race-Driven Rear Standard Brake Rotors and Severe Duty Sintered Metal Brake Pads. If you have any questions about this product by Race-Driven, contact us by completing and submitting the form below. If you are looking for a specif part number, please include it with your message.